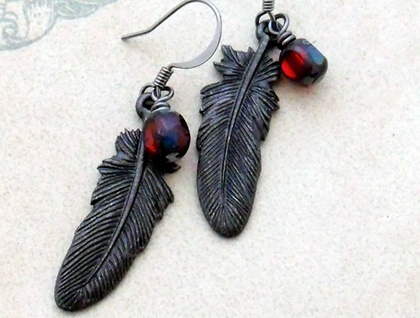 Dark red glass beads, with verdigris-like edges, accompany raven feather charms to form these dramatic, gothic style earrings. 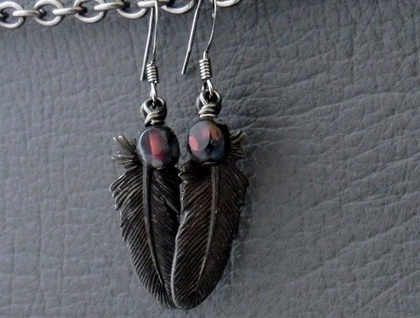 The feather charms are dark, charcoal grey, almost black, and have wonderfully lifelike detailing. To the naked eye, their finish seems smoother than it may appear in the photographs. Czech glass is famous worldwide for its high quality. These faceted beads, in a rich garnet hue, are translucent, with unusual, stony-looking edges. 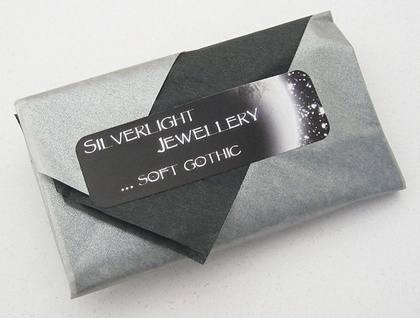 The 'stony' edge is a dark, greenish, stippled or mottled colour that looks almost like tarnish. It is smooth and matte to the touch. Three 'windows' in the finish allow the deep, 'blood wine' colour of the glass to show through. 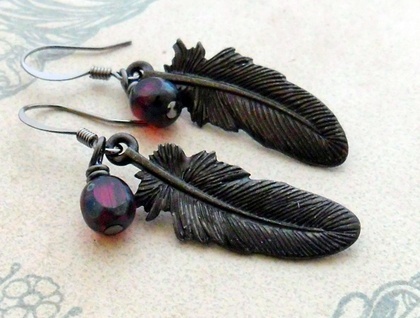 The 'Raven Plume' earrings measure 44mm from top to bottom. The feather charms are 29mm long, including the baile (the hanging loop at the top), and 10mm across at their widest point. The ear hooks are made of brass, covered with a gunmetal black coating.